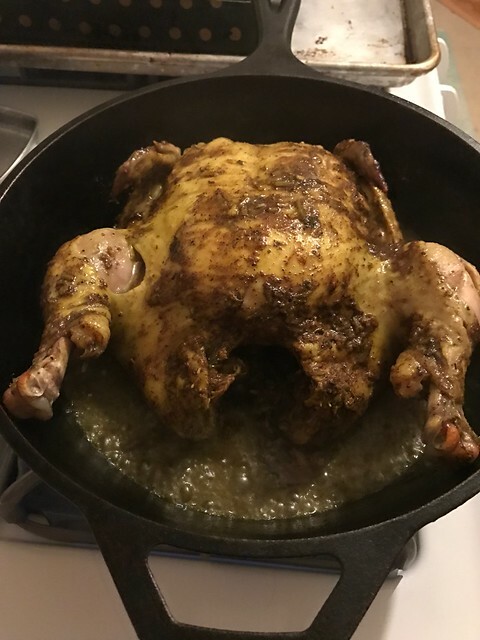 This is a Jamie Oliver recipe that requires you to spatchcock your chicken, but I decided to keep it whole and do less work. This increases the cooking time in the oven, so I just made sure the chicken fit snugly in my deep cast iron pan so that I could easily transfer it from the oven to my stovetop to finish. If you are using a regular roasting tray, transfer the chicken to an already-heated frying pan, deep enough to hold it and its juices. I marinated the chicken a day just to make sure the flavor set in. If you only have a few hours to do so, try this with smaller chicken pieces. 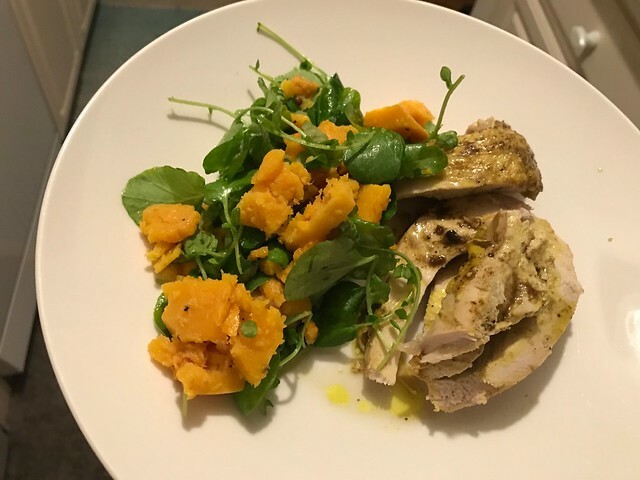 I carved the chicken and served it with some greens and leftover roasted butternut squash. 1. Make the marinade. Melt the butter in a small pan. In a blender, pulse together the garlic, ginger, turmeric, cinnamon, cilantro stalks, and lemon zest. Squeeze in the juice from half the lemon. Season with salt and pepper and pour in the butter with a tbsp of oil. Keep blitzing until a bit pasty while adding more oil if it’s a little too thick. 2. Rub this marinade all over the chicken, working it into all the nooks and crannies. If you are marinating in advance, cover the chicken and pop it in the fridge until needed. 3. When you’re ready to cook the chicken, preheat your oven to 375º. Place the chicken in a deep-enough snug-fitting cast iron pan and spoon over any marinade that may have fallen off. Cover the tray tightly with foil and roast in the oven for 1 hour and 10 minutes. The chicken should be cooked through. Check by piercing the thigh with a sharp knife. If the juice that runs out is clear, you’re okay. 4. While the chicken is cooking, toss together in a bowl the scallions, chile, and cilantro leaves with the remaining lemon juice. Set aside. 5. Carefully transfer the chicken from the oven to the stovetop on medium heat. Baste it with any juice from the tray and drizzle it all over with the honey. Cook until the chicken skin is golden. Serve the chicken with the scallion garnish.